The perfect ecological gift: recycled, extremely durable, and repairable. 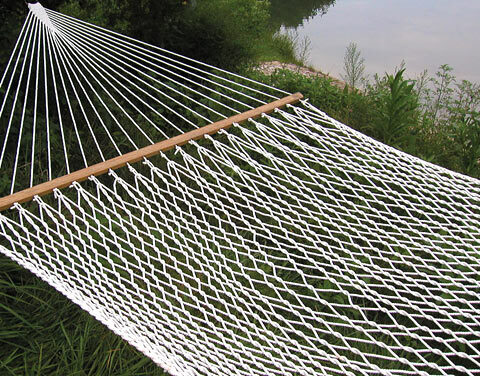 Handwoven from soft, weather resistant Envirope® rope. Envirope is twisted on our rope machines from 100% post-consumer waste polyester Eco-Spun fiber. The fiber is made mostly from recycled soft-drink bottles. Our White Oak spreader bars are made from locally cut second growth trees sawed at our worker owned, high-efficiency mill and processed in our wood shop, treated with natural Linseed oil for outdoor durability and a beautiful shine! Matching pillows and stands are available, sold separately. 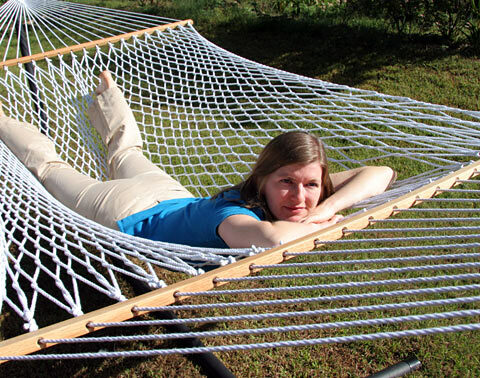 Keeps 72 soda bottles out of landfills per hammock! Bed size is approx. 7 ft. x 5 ft. Overall length approx. 13 1/2 ft.